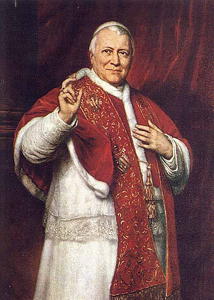 The Order of Pius IX was founded on June 17, 1847, by Pope Pius IX. The grades in which the Order are given are, from highest to lowest, Knight Grand Cross (1st class), Knight Commander with Star (2nd class)*, Knight Commander (3rd class), and Knight (4th class). There is also an additional grade above that of Grand Cross, and that is Grand Collar. This is generally reserved for heads of state. The grade of Grand Cross is typically awarded to ambassadors to the Holy See of foreign states. In the case of all grades of the Order, the Holy See if free to dispense the honor as desired. Since 1994 women have been admitted to the Order as Dames in the same grades and divisions as men. It was also Saint Pius X who gave Papal knights a place of honor in Papal processions and ecclesiastical ceremonies. As with all Orders of the Holy See, there is no set method of nomination for this Order. The Holy See is free to nominate and award in any manner in which she sees fit. However, awards of the Order of Saint Gregory the Great are typically made on the recommendation of Diocesan Bishops or Archbishops or Nuncios for special merit or service. If it is processed through the local Bishop, then the usual procedure is for that Bishop to nominate the candidate through the appropriate Apostolic Nuncio, who then forwards the recommendation to the Cardinal Secretary of State in Rome. Awards are also sometimes made on specific recommendation of members of the Roman Curia. Specific procedures can vary. Upon approval, a diploma is issued in Latin (with the candidate's forenames also translated into Latin where possible), and it is signed in almost every case on behalf of the Roman Pontiff by the Secretary of State of the Vatican. The award also usually requires the payment of a nominal "tax" to cover expenses concerned and support the work of the Church. It may be paid by the recipient or by someone else on his behalf. Even though Vatican reforms no longer confer a special status on Papal knights, the receipt of a Papal knighthood ought to serve as an impetus for service on the part of the recipient. Sometimes non-Catholics receive the honor. 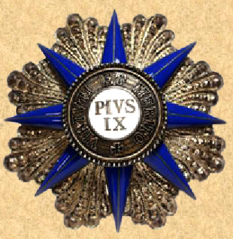 The insignia of the Order of Pius IX follows the standards for Papal decorations. Those who hold the Grand Collar wear the chain around the neck. 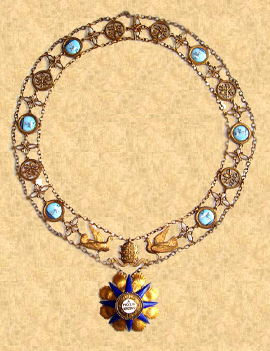 The Grand Cross is worn suspended from a broad ribbon over the right shoulder, with a star worn on the left breast. The two grades of Commander wear the badge suspended from a ribbon about the neck, the Knight of the 2nd class also wearing a star. Simple Knights wear the badge from a ribbon drape on the left breast. The uniform, which is now rarely worn, consists of a dark blue coat, richly embroidered, white trousers, and a plumed hat and sword. Ladies do not wear the uniform. The ribbon for a Dame Grand Cross is more narrow than that of the Knight Grand Cross. The Order may be presented simply by the receipt of the diploma, or there may be a simple or formal investiture. This is at the discretion of the nominating Bishop. Only rarely are ceremonies conducted in the Vatican, and usually this is for major public figures, heads of state, or other diplomatic officials. There is no single authoritative source of the membership of the Order of Pius IX. As the award of Papal knighthoods now no longer conveys special status, it is unusual for them to be published in Acta Apostolicae Sedis (Philippe Levillain, ed. John W. O'Malley, tr. The Papacy: An Encyclopedia (2002) vol. ii s.v. "Nobility, Roman"). Some private associations of knights around the world maintain their own lists, but these speak only to their own membership. These organizations include the Associazione Decorati Apostolica Sede, the Associazione Decorati Pontifici, the College of Pontifical Honorees, and the Association of Papal Orders in Great Britain. Additionally, some individual scholars and enthusiasts have attempted to give definitive numbers of recipients of Papal honors by country. Due to the nature of the award, these lists are always incomplete. * This grade is often referred to as Grand Officer, but in the context of Papal orders, it is most properly called Commander with Star.